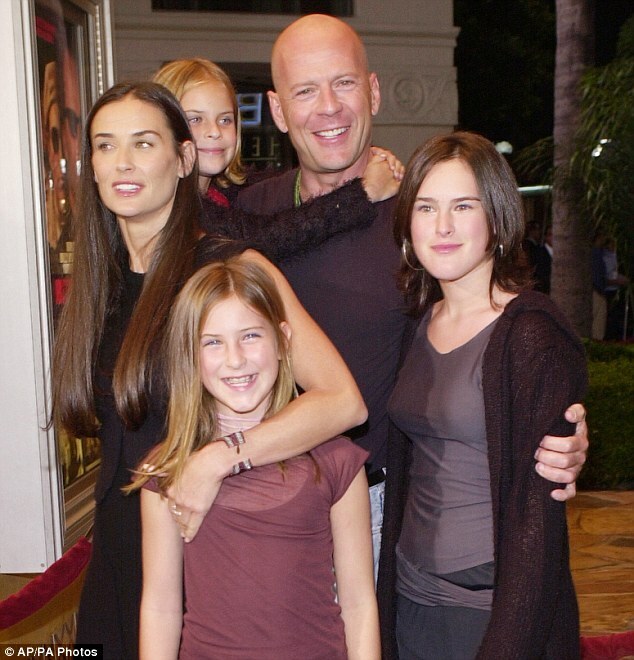 It appears the apple has fallen far from the tree as Rumer Willis and Demi Moore cut very different figures yesterday. The strain of her split from Ashton Kutcher was still visible on Demi last night as she stepped out looking more gaunt than ever before. The actress was at the Cinema For Peace event at the Montage Hotel in Beverly Hills, California, with and her legs and arms on show looking painfully thin. The 48-year-old was keeping up appearances by attending the glitzy showbiz event but it was clear that she is still struggling to come to terms with the end of her third marriage. Demi, who looked a shadow of her former self, wore a slim fitting black dress which showed just how much weight she had lost from her usually toned physique. The mother-of-three had suffered severe weight loss on her legs with her thighs and calf appearing to be the same thin waif width from top to bottom. The Charlie's Angels: Full Throttle star showed that she was still keeping the faith by wearing a red string Kabbalah on her left wrist. Demi, who is currently filming Lovelace with Amanda Seyfried and James Franco, was joined by her eldest daughter from her second marriage Rumor Willis. Rumor, 23, was in much healthier shape than her mother and wore a black dress with a sheer top that showed off her fuller figured body. The red head actress has followed her parents into the family business but is yet to scale the dizzy heights that her father, Bruce Willis, reached in his heyday. Demi and Ashton’s relationship broke down after claims emerged that the actor had cheated on his wife with 22-year-old Sara Leal, on the weekend of his wedding anniversary. On November 17 2011, Demi announced that she was filing for divorce from her toyboy husband after six years of marriage. In a statement she said: 'It is with great sadness and a heavy heart that I have decided to end my six-year marriage to Ashton.